Prevents and reduces any injuries from occurring. Mouth Guards are protective appliance use to cover the teeth and gums. They are mostly use during physical activities to prevent injuries. They can be helpful outside of sports too. For instance, you might need to use a specialised mouthguard for jaw issues or teeth grinding. 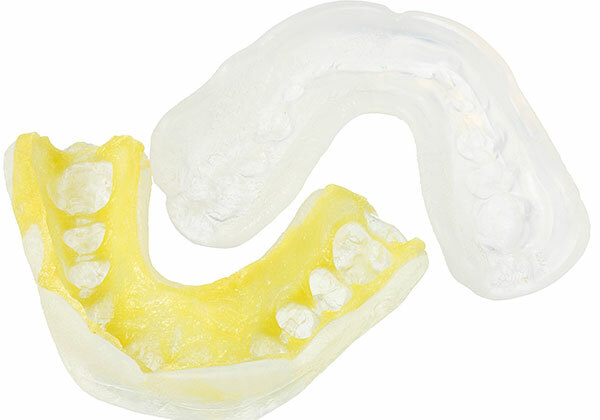 Dentists sometimes use special types of mouthguards to help treat snoring or sleep apnoea as well. Constructed and fitted by a dental professional, a customised mouthguard provides the best protection for your teeth. The dentist takes an impression of your teeth and makes a plaster model to get the perfect fit. The mouthguard needs to be at least 4mm thick, with a cushioning effect that provides protection against impact. It fits snugly so it’s still possible to talk – an important aspect during an intense match. Over-the-counter mouthguards that are self-fitted by immersing in hot water then biting into the mouthguard so it takes the shape of the teeth and mouth. It’s less effective and can be more uncomfortable as it doesn’t conform as well to the person’s bite and anatomy of the jaw.